Greer lived an unremarkable life through her formative years, focusing well on her studies in school along with being active in sports and extracurricular activities such as the science club. Her parents, Gregson and Janet, supported her well in her endeavors and provided a stable home. Greer fell in love with rookie policeman Bill Nelson during her second year at the University of Chicago. After marrying him, she dropped out of school at his urging. She ended up alone when he was shot and killed, none of the jobs she could find being of any appeal to her. After crossing paths with her former physics professor, Dr. Joanne Tumolo, Greer was hired as a lab assistant and went back to college to work toward her Bachelor of Science degree (not yet completed). She soon learned Dr. Tumolo had a secret project intended to help women reach their highest potential. The hope was for Greer to be the first one to try the process. Greer was not the first, as Malcolm Donalbain, a wealthy man with a chain of health clubs who helped fund the research when Dr. Tumolo was short on money, threw his weight around and had his own choice of the first subject, Shirlee Bryant. In private, Greer convinced Dr. Tumolo to try the testing on her as well. This led to enhanced mental and physical abilities in her. This paid off when Donalbain's true motives were revealed. He wanted a cadre of women under his control to eventually take over the country through the use of their enhanced abilities and the costumes. Shirlee fell under his spell when she donned a collar that removed her will, but she died in a fall during the testing phase. Donalbain tried to cover things up by attempting to destroy Dr. Tumolo's lab and work, but Greer took an extra Cat costume and stopped Donalbain's plans. Greer's life became more connected than ever to the feline visage after she used her talents and the costume to help fight a variety of villains in Chicago. After learning Dr. Tumolo was not dead but instead in recovery, Greer interrupted an attempt by Hydra to make off with the doctor. However, they put her life in serious jeopardy when she was hit with a blast of alpha radiation during the fight. In order to save Greer's life, Dr. Tumolo began a ritual that forever tied Greer to the Cat People through the bonding of one of their souls to her. This was done with her permission, and Dr. Tumolo herself was actually a descendant of the Cat People. Greer, who had previously gone by simply "The Cat," now had no more need of the costume and its own enhancements, known from that point on as Tigra, changed further both physically and mentally. Now visibly different, Tigra does possess an amulet obtained as part of the ritual. It can be used to create the illusion of her looking fully human again, but as far as she knows she is permanently altered as a combination of both human and feline, with a strong connection to the Cat People of Land Within, a pocket dimension. Whether or not this changes down the line remains to be seen, but her future is wholly unwritten. Good — At her core, Greer is driven to do right and help those in need. It showed most clearly when she first gained heightened abilities as The Cat, but the values had already been instilled in her from good parenting and an understanding of right vs. wrong. As Tigra, she is even better equipped to aid others and all that remains is finding the best ways of doing that. Catty — Not so much the typical usage, but literally in relation to what Greer is now. 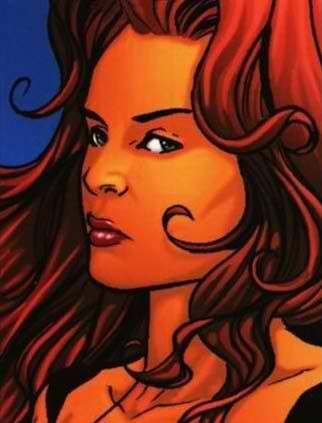 When she was near death and bonded with the soul of a Cat Person, she recovered and became Tigra. The changes are not only physical or visual. She's taken on a wide variety of mannerisms typically seen in felines. She can be the biggest attention-seeker on the planet one moment, then completely ignore someone the next. One is just as likely to find her snoozing in the sun as they are coming across her in a state of rapid activity. She loves tuna and milk, but isn't a big fan of water or rocking chairs. Baser instincts might result in her hunting a mouse or bird, if not something larger, and one may never truly know what version of her they'll get, be it playful or aggressive, with room in between. This can and does lead to inner conflict at times, given much of her past personality has essentially been overwhelmed by the cat within. Expect the unexpected. Intelligent — In spite of her more primal appearance, Greer did go to college with the purpose of earning a Bachelor of Science degree following excellent grades in high school. 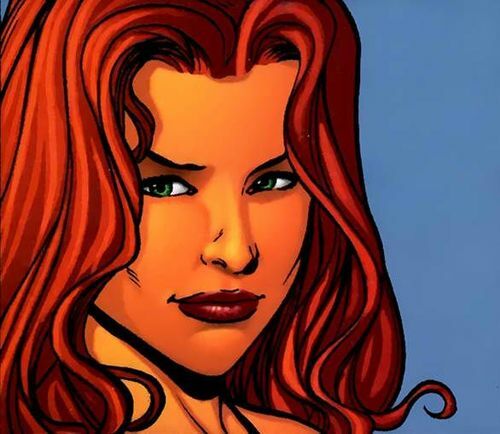 The pursuit of the degree has been interrupted following the circumstances that led to her becoming Tigra, but she's retained the knowledge gained from her past studies. She's well-spoken, the occasional growl, hiss or roar notwithstanding, and tends to stay up on current events, pop culture, and various trends. Enigmatic — Somewhat related to her feline side, there is a part of Greer that is hard to pin down when it comes to commitment. She already married at a young age and became a widower soon after, which has affected how much trust she'll put in others when it comes to relationships. There are times when she's more prone to a fling than anything serious, and flirting is not out of the norm for her. When it comes to working with others, it isn't something she's had to put much thought into yet. By and large, she's played the part of a loner because that's all she's known since the changes. If and how she fits into a group of others with a similar purpose remains to be seen. Surely there are ways to "tame" her, but they must be found out through trial and error. Goals — Chiefly, Tigra seeks a purpose and a place in the world. There is the start of that in playing the role of the heroine, but she's never had any formal training in that field. Oh, she knows of various good guys out there, but she's literally running on instinct more often than not at this point. Going from the starting point of helping others in need is a good beginning but even if she enjoys her frequent loner mentality, she understands strength in numbers. Sometimes, though, all she needs on a given day is a warm spot to sleep on and a full belly. Ultimately, a primary goal will be finding and maintaining a healthy balance of human and feline sides. She just hasn't had much time yet to even figure out what that balance might be, or if it even matters. She would also like to complete her degree. Motivations — Greer knows how close she was to death before becoming Tigra. She cheated death, came out on the other side drastically changed but gifted with abilities a select few can lay claim to, and she'll be damned if she lets it go to waste. This means doing right by others wherever possible, better if it means joining up with others along the way, but sometimes the impulsive nature of all felines interferes with following that particular path. Body — Tigra possesses sharp, retractable claws on each finger and toe, capable of cutting through materials as tough as steel. In addition, she has a few fangs that are especially good for tearing into enemies should she have need of it. Though she is not invulnerable, she is capable of taking more punishment than the normal person before showing signs of injury. She's agile and graceful enough to exhibit total control over her body when in motion, also able to balance along narrow paths the average human would struggle with or climb things others could not. Reaction times are also swift enough to make her a formidable foe in a fight and she can go longer than most before tiring. Senses — Roughly on par with an actual feline's, even better in ways, Tigra's capable of seeing quite well at night, reading changes in others from scent alone, and can also see well beyond the distance a normal human could without visual aids. Having a cat's eyes also affords her a wider range of vision than normal. These senses make her a naturally gifted tracker and fit for any role that would benefit from such things. This may include guard duty or infiltration, for example. A drawback to this comes in being more susceptible to things that would affect the senses, such as loud noises, pheromones, etc. Healing — Broken bones mend in days, while lesser injuries like cuts and scrapes may as well not even matter for the speed in which they heal. This enhanced healing does not extend to any lost limbs or vital organs that can't withstand normal complications, though she does naturally fend off the average flu, virus and so on. Strength — Tigra can lift as much as ten tons, somewhat more than that if the adrenaline is pumping in a major way. This also means her punches and strikes carry more behind them than it would appear. Speed — Outrunning a world-class sprinter is a cinch for Tigra, who can even reach a typical highway speed limit for short bursts if need be. Leaping — Tigra is able to jump a good dozen vertical feet from a standing position, along with three to four dozen horizontally with a running start. 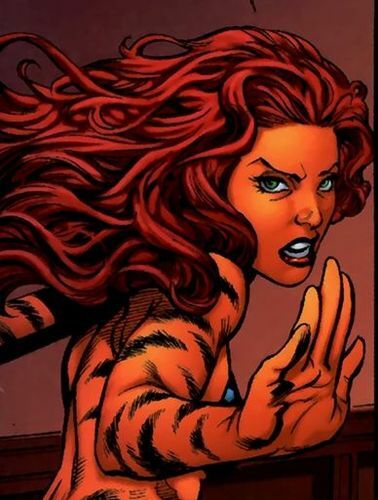 Cats — Essentially being one of the Cat People now, Tigra is gifted with the ability to communicate with other felines. This shows up mostly in combinations of body language and vocalizations. She may even use these forms of communication on people to varying degrees of success. Funds — Following the death of her husband, a small account was set up in his name through the precinct he worked for. This only covers enough for Greer to "get by" month to month and is due to run out around the middle of 2015. Amulet — The cat amulet or pendant Greer possesses and wears as part of her outfit has a mystical basis tied to the Cat People. While it does not allow her the ability to transform back to the appearance of a normal human, it can create such an illusion. This is visual only. Parents — Greer has the support of her parents when it comes to helping her through things when needed, but she does not have much else of her own yet besides a place to stay. Playing the part of a solo heroine doesn't cover many expenses. Dr. Tumolo — At this point, Dr. Joanne Tumolo is someone with an obviously close and vital connection to Greer, having saved her life in the process of turning her into Tigra. She could be sought out for advice or other basic needs, and she has ties to the Cat People by way of being one herself. Dr. Tumolo could be visited for purposes of learning more about them. Hand-to-hand — While untrained formally, Tigra's skills in close combat come naturally due to her physiology, quickness, and reactions. Her style is best described as "controlled fury," at least when she's under control of herself. Hack and slash is the name of the game, staying a step ahead of someone else whenever possible. However, someone well-trained and good with tactics stands a good chance of outwitting her or luring her into leaving an opening to exploit. Acrobat — Tigra is not a gymnast, though she could put most of them to shame if she cared enough to. Her balance is off the charts, the level at which she can control her body is exceptional, and she has all the grace of the best feline one could imagine. That adage about cats always landing on her feet? That applies to her too, except when something gets in the way of doing so. Science — Showing an interest in it in school and taking courses toward a degree, Greer felt an affinity toward the natural sciences, including physics, chemistry, and biology. Going forward, how much of that knowledge factors in remains to be seen, but she has at least an intermediate to advanced understanding of these subjects as far as a typical college education is concerned, plus plans to finish the degree somehow. Stealth — Tigra understands how to be quiet, and she even has soft pads on her feet to aid in this if she's really trying to sneak around without being noticed. In part, this is a natural gift. It can also be improved further through instruction from those better at it than she is. Tracking — Much like stealth, this comes mainly from the natural abilities Tigra possesses. Having enhanced senses that go well beyond normal human ranges means she can spot, hear, and otherwise sense things most cannot. When it comes to hunting, this is invaluable. Survival — It's not something anyone really does by choice, but there are select abilities that make someone more likely to get through rough patches in life. Knowing how to build a fire, defend or fortify an area, and things of that nature are good, but they aren't quite in the scope of Tigra's knowledge yet. Primarily, it's in being good at hunting, killing, and eating what she catches, if she's forced to go that route. Being part cat now, she's willing and able to do it. Technology — Prior to becoming Tigra, Greer was no different than the typical college student when it came to things like driving, computers, smartphones and the like. She was and is computer literate, and she can drive just fine if there's a reason to. Fast Learner — Give Greer something to do that she's interested in and she'll pick up the basics quickly enough. With minimal repetition, she's off and running with it on her own. It helped her excel in her schoolwork and it should serve her well as she finds a comfort level with her new life. Appearance — One look at Tigra is proof enough to understand she's abnormal. This will undoubtedly lead to both good and bad experiences for her. Even though she has the ability to give off the image of looking like anyone else, she seems reluctant to do it unless absolutely necessary. Impulsive — Tigra can be like a sudden Nor'easter, calm one minute, raging the next. It's not so much an anger issue as it is an "Ooh, shiny!" sort of thing where something will suddenly capture her attention, be it a thought, object, or person, and she's off doing something else. It can make her difficult to rely on at times, but it's only a problem when her focus drifts. Or, more likely, she just has a "cat" moment. Flirtatious — Whether or not it's part of her feline nature, Tigra may say or do things that can be taken as inappropriate by others, though some could be receptive to her attention. Speaking of attention, that's normally the reason for it. Whether or not she has true feelings toward someone that causes her to be drawn to them, it's most often an attempt to seek some sort of indulgence. No telling how long it might last. Feline Mentality — Basically, Greer is no longer the woman she used to be. As Tigra, she is both woman and feline, with all the pros and cons attached to it. There are times where it's difficult to tell which side is more in control, especially when she's driven by feline instinct and impulse. It could take creative efforts to get her to focus on whatever's more important, but she's just as prone to placing more interest in finding a sunny spot to nap as she is to deal with the bad guy of the moment. Needless to say, this holds the potential for added distractions when they're least wanted. Widower — No matter who or what she is now, there's no forgetting that Greer's first husband was killed, leaving her a widow. The love of her life was taken away from her and there's always the possibility those nightmares will resurface at any time, which could leave her despondent and sullen until she's able to get past it again. It could also have the side effect of preventing her from getting too close to anyone else beyond flirting, out of fear she could love and lose someone a second time. Solo — Make no mistake, it's a lot harder to go out and play heroine when there's nobody to back you up. Tigra may give off the impression she's perfectly fine as a loner, but even she knows it'd really be better to team up with someone from time to time. Until that becomes more the norm for her, she will be at a potential disadvantage in spite of her own abilities. 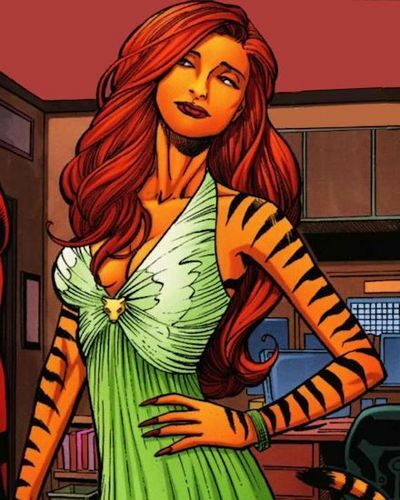 Though not well-known yet in the world of supers and metas, Tigra has developed a small reputation for herself as a feline fighter of crime in the Chicago area. It's not yet known if she's affiliated with anyone else or not, or where she might turn up next, but those who keep up on such things may have heard rumors of her. 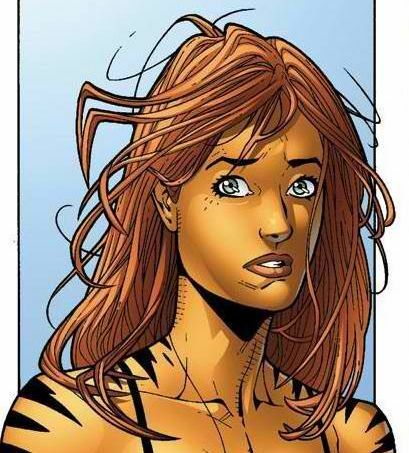 NOTE: This version of Tigra is primarily normal Marvel in physical appearance, just with some inspiration from the anime/manga style for coloration. The outfit is also different from usual. Sleek. Strong. Feminine. Feline. Tigra is all this and more, evident with but one glance her way. A couple inches shy of six feet tall, it's clear she's touched by a wilder side, most evident in the striking image of what some may simply refer to as a were-tiger. Rather than the usual skin, she's covered in a layer of fur, orange with a bit of a lighter, creamier color beginning from her chin down the front, plus the inner areas of both arms and legs. Along with that, black stripes consistent with what one would expect to see on any tiger, right down to the tail. Yes, she's got one of those as well, and it behaves just as it ought to. Her face is mostly human, hair a darker shade of orange than the rest of her, closer to red than not. It falls as it will to shoulders and the middle of her back, some curls here, bangs there, frequently on the edge of well-kept and untamed. Features easily shift between soft and playful to something more predatory and primal, dependent on her moods. She has a small nose, her mouth (which does have sharper fangs) is proportionate to the rest of her face, there's a strong chin, and green eyes reveal slitted pupils. Pointed ears may be noted as well, when not hidden by her hair. When it comes to the rest of her, the athletic strength of the tiger is represented well in her more human form. Preferring convenience over anything else, she wears no more than a black half-bodice and shorts, both fitting snugly with a faint sheen to them. The top, which ends above the midriff, features a pair of straps over the shoulders and a few more in back to keep it in place, providing modesty for her ample bosom, a small amount of cleavage seen. Set in the fabric between her breasts is a silver cat's head amulet. The shorts are designed so they don't get in the way of her tail, cut low while ending a few inches down her thighs. Adorning the waistband, front and back, is a set of claws. She goes barefoot, showing off claws that tip each finger and toe. Meow. Nov. 2014: Tigra ventures forth from Chicago to explore New York City, Gotham City, and Metropolis in hope of finding a new place to settle in, at least part-time.